Watch this video to learn what the VIF App can do for you and how to use it. IF you want the paper version - REPLY TO THIS THREAD and I'll e-mail it to you. I have a lot of people that have e-mailed me and also sent me PM's to get a copy of my VIF form for their detailing business. 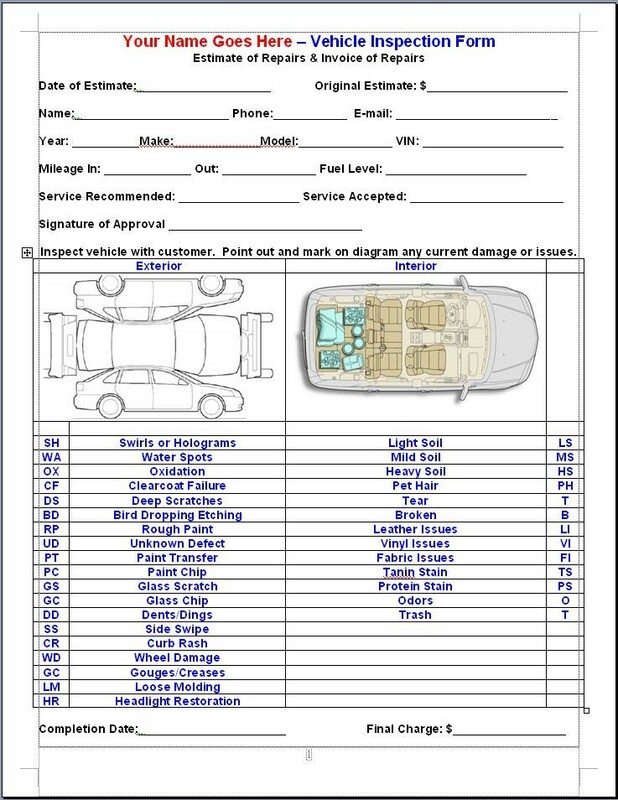 This form is vitally important and if you're detailing cars for money, either part-time, full-time or as a hobby then you should not touch the car until this form is filled out and signed by your customer. I obtained the original version of this form years ago from my long-time friend and professional detailer, Lenny House. I tweaked it with my own customizations to make his form work better for me. I've also asked for input from my good friends and professional detailers, Renny Doyle, Joe Fernandez and Robert DiTerlizzi. This form will be a living document, that is... I expect and encourage all our forum members to get a copy, use it and if you find a way to improve it for the benefit of all of us then your improvements will be added and the official form updated. I consider myself a perpetual student in that I'm always learning and always open to new ideas, technology, pads, products etc. This also means I'm always open to feedback to improve this form to continually make it the best it can be. Plus, your name will be added as a contributor to the form. Below I will maintain current Screen Shots of the form as it evolves. You should have a package for every customer, every car and every budget. Don't spend your customers money for them, let them decide the level of perfection they want for their car. I highly recommend doing your best to educate your customer on the paint on their car and what you can do for it but also, don't oversell customers. By this I mean, don't put a show car finish on a daily driver commuter car. While this might be your passion it's a disservice to both you and your customer. I've included a link to an article I wrote on this topic down the page a ways, if you have not read it yet, take a moment to do so. On this page you can edit the words Package 1, Package 2 and Package 3 with whatever terms you prefer, for example, Bronze, Silver, Gold. etc. You can and should also insert the hourly charge for what you currently charge in your business. The two tables for information on products, pads, and tools you use can simply be deleted if you don't want to get that deep with your customers. I included this as an option for the purposes of educating your customer to earn their trust, show that you're knowledgeable about your craft and to help you increase your hourly prices. By education your customers you demonstrate you're knowledgeable about your trade while at the same time by default you show-up any competitors that don't want to share what products, pads and tools they use. Using this type of information is completely up to you. 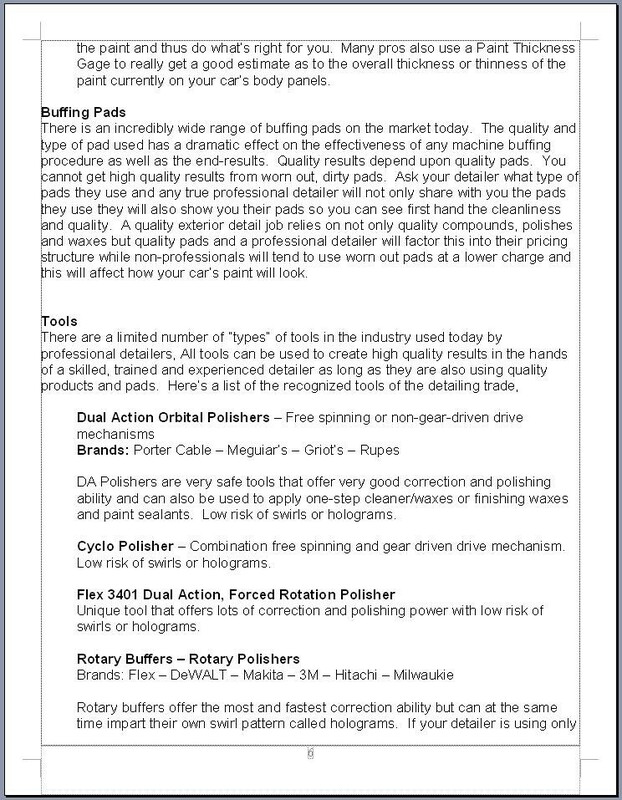 The third table on this page is to up-sell your customer to a coating. Coatings not only have a higher "cost" price but they also take more and special prep work in order to apply them plus the skill, knowledge and talent to apply them correctly. You need to make sure you're charging for the application of a coating. 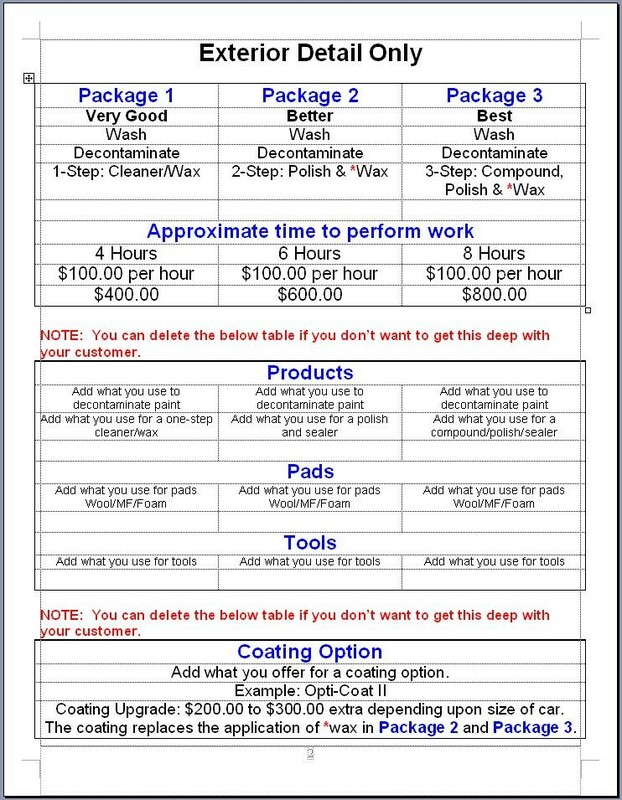 In the table below you can custom edit it to showcase which coating or coatings you offer and this opens this section of this form opens the door for you to present your customer with this option. Again, since this is a Microsoft Word Document, you can simply modify or delete the second and third tables and when you do this the "Terms" information will move up under your "packages table". The below is the section that spells out the agreement for services rendered and the customer's signature of approval to do the work. Do not "touch" anyone's car until the above inspection form is filled out with the customer and the customer signs and dates the form. At the very bottom of this page is a call-out box asking for referrals to grow your business. I find most people tend to be shy about asking their customers for referrals, so this call-out box is to both remind you and to help you to ask for referrals. At this point in the form you can choose to only print out the above when selecting how many pages to print from your printer options. If you like, you can include and print out the below pages and staple and include them with the above pages or staple them as an "Information Packet" to give to your customer. 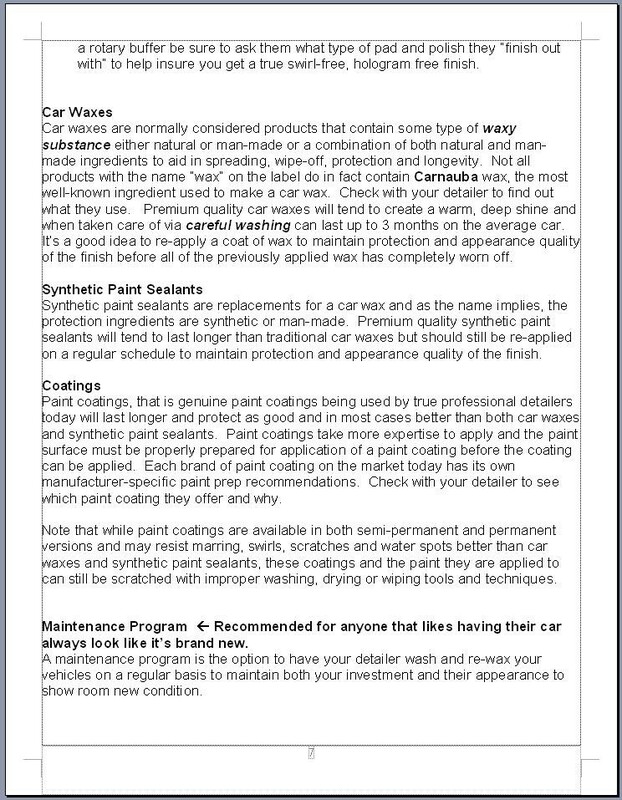 The below information shares with your customer, or potential customer some more very basic information to you and I but more than likely some information that is new to most non-detailers. Read through the below and I think you can see where if your customer has any questions at all bout the procedures you personally use in your business, you can use the below to bring them up to speed. Again this will not only educate them but also show them that you truly know what you're doing. This is helps you anytime you want to work on what I call SIV's or Special Interest Vehicles, the first thing you have to do is earn the owners trust and if you don't have a "warm introduction" from someone that can vouch or you then all you have left is yourself to demonstrate that their "baby" is safe in your hands. The below also "gently" shares that doing more steps requires more time and the price of the packages you offer reflect the time it requires to do more work to create a nicer finish if that's what your customer wants. 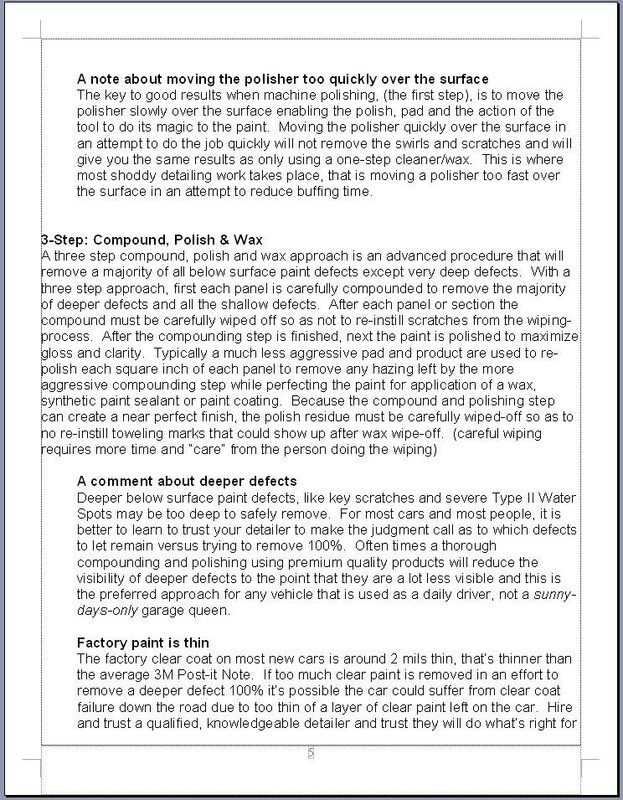 For the majority of your customers, you should only be doing a one-step procedure to the paint after normal washing and decontaminating. What a one-step will do and what it won't do is also included in the sections below. See this article for more information. At the bottom of the last page is a promotion for my book. And of course you are completely free to delete all of this information too. I highly recommend setting your best customers up on a maintenance program and by doing this you can simply bill them monthly. This provides you with a consistent cash flow at the beginning of each month which makes paying your own bill easier. For those customers that do not want you to regularly wash and maintain their cars, sharing my how-to book with them will at a minimum provide them with all the information they will need to maintain your hard work. 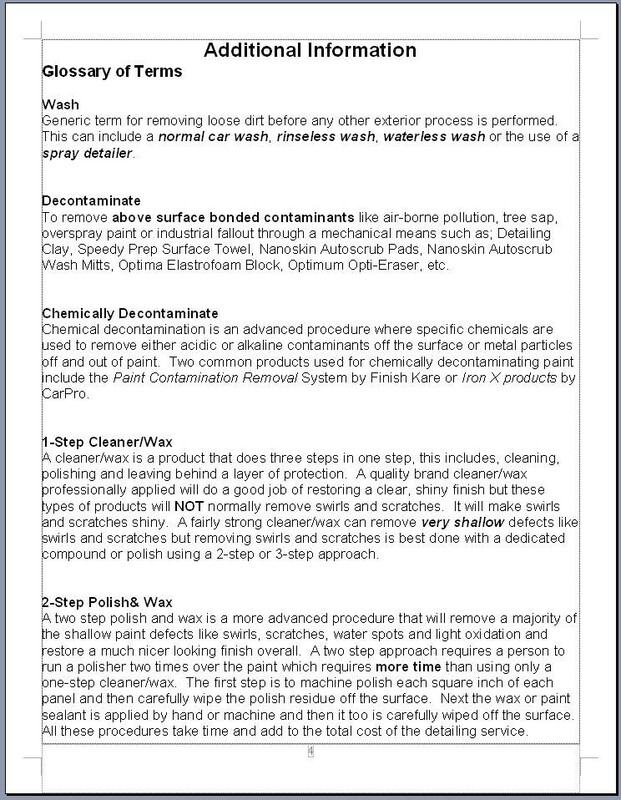 You could also type up your own booklet on how to wash and maintain a freshly detailed car. 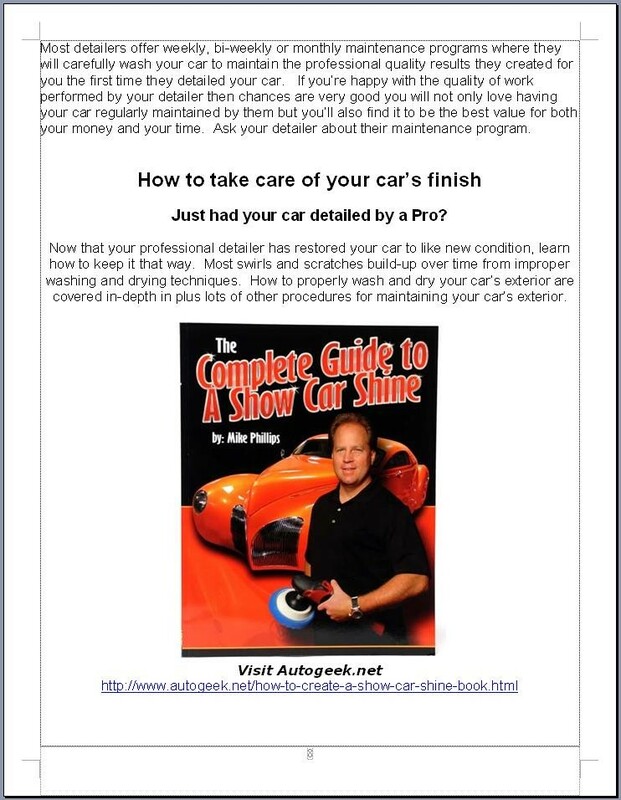 Keep in mind, most people that hire you to detail their car are doing this because they don't want the hassle or the time investment, so providing them information about how to get my how-to book isn't going to take business away from you. Again, to remove this portion, simply open this file up in MS Word and delete any and all portions you don't want to use, safe the file and print out your custom forms as you need them. So thank you for being patient if you've been waiting for this form but I assure you the wait is worth it as you have some of the best detailers in the world working to create a very much needed form in our industry. If you have suggestions for improvements, please post them to this thread, if they are used I will add you to the list of contributing detailers above. If you want a copy of this form, reply to this thread and I'm happy to share it with you. Patiently waiting. I definitely need something like this. Look forward to seeing the final copy! Incredible. Looking forward to seeing the finished document. Will this be made availible on the forum or should we send you a pm for it? It is amazing how your read my mind Mike, I was just about to send you a PM about the VIF. Thank you for doing the work for us! 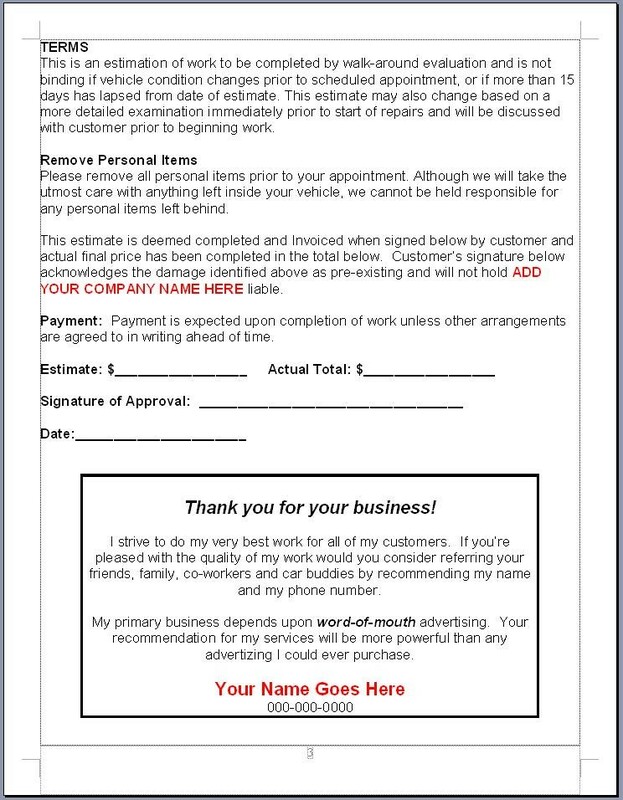 Using a form such as this not only protects YOU the detailer but also provides a perfect time to highlight/review additional damage in order to upsell services to remedy the issues you point out. I eager anticipate our meeting Mike! This form is valuable. I do use one similar to it but the collaboration of detailing professionals on this form is going to make this a very powerful business tool. I have a similar form that Mike P. sent to me a few months back. Not sure if it's the older one or the newer one, but it won't matter anyway with what these folks are getting ready to do. Can't wait to see the final version and put it to use. That would be the older one as the newest version has input by both Renny, Joe and Robert and all their suggestions helped to improve the newest version.